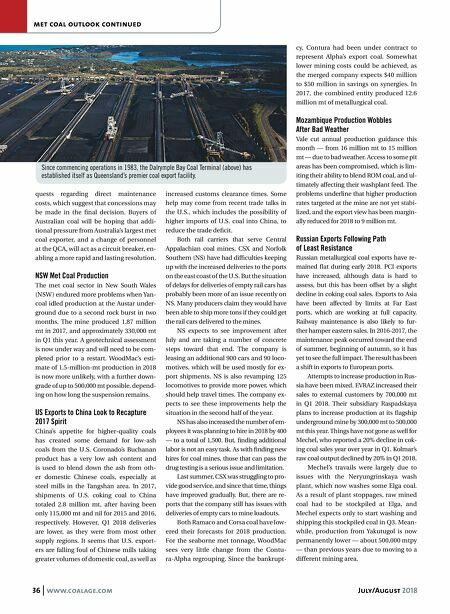 36 www.coalage.com July/August 2018 met coal outlook continued quests regarding direct maintenance costs, which suggest that concessions may be made in the final decision. Buyers of Australian coal will be hoping that addi- tional pressure from Australia's largest met coal exporter, and a change of personnel at the QCA, will act as a circuit breaker, en- abling a more rapid and lasting resolution. NSW Met Coal Production The met coal sector in New South Wales (NSW ) endured more problems when Yan- coal idled production at the Austar under- ground due to a second rock burst in two months. The mine produced 1.87 million mt in 2017, and approximately 330,000 mt in Q1 this year. A geotechnical assessment is now under way and will need to be com- pleted prior to a restart. WoodMac's esti- mate of 1.5-million-mt production in 2018 is now more unlikely, with a further down- grade of up to 500,000 mt possible, depend- ing on how long the suspension remains. 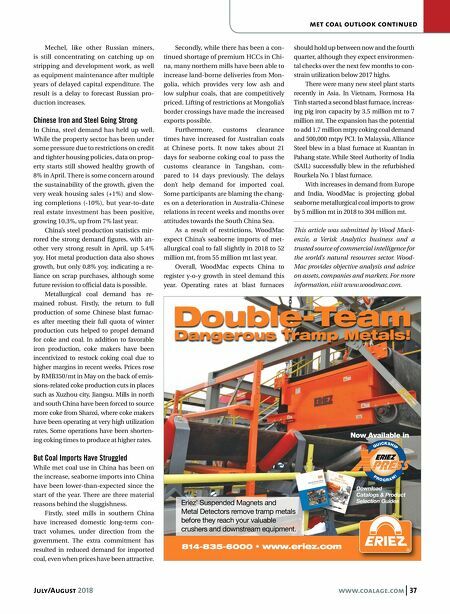 US Exports to China Look to Recapture 2017 Spirit China's appetite for higher-quality coals has created some demand for low-ash coals from the U.S. Coronado's Buchanan product has a very low ash content and is used to blend down the ash from oth- er domestic Chinese coals, especially at steel mills in the Tangshan area. In 2017, shipments of U.S. coking coal to China totaled 2.8 million mt, after having been only 115,000 mt and nil for 2015 and 2016, respectively. However, Q1 2018 deliveries are lower, as they were from most other supply regions. It seems that U.S. export- ers are falling foul of Chinese mills taking greater volumes of domestic coal, as well as increased customs clearance times. Some help may come from recent trade talks in the U.S., which includes the possibility of higher imports of U.S. coal into China, to reduce the trade deficit. Both rail carriers that serve Central Appalachian coal mines, CSX and Norfolk Southern (NS) have had difficulties keeping up with the increased deliveries to the ports on the east coast of the U.S. But the situation of delays for deliveries of empty rail cars has probably been more of an issue recently on NS. Many producers claim they would have been able to ship more tons if they could get the rail cars delivered to the mines. NS expects to see improvement after July and are taking a number of concrete steps toward that end. The company is leasing an additional 900 cars and 90 loco- motives, which will be used mostly for ex- port shipments. NS is also revamping 125 locomotives to provide more power, which should help travel times. The company ex- pects to see these improvements help the situation in the second half of the year. NS has also increased the number of em- ployees it was planning to hire in 2018 by 400 — to a total of 1,500. But, finding additional labor is not an easy task. As with finding new hires for coal mines, those that can pass the drug testing is a serious issue and limitation. Last summer, CSX was struggling to pro- vide good service, and since that time, things have improved gradually. But, there are re- ports that the company still has issues with deliveries of empty cars to mine loadouts. Both Ramaco and Corsa coal have low- ered their forecasts for 2018 production. For the seaborne met tonnage, WoodMac sees very little change from the Contu- ra-Alpha regrouping. Since the bankrupt- cy, Contura had been under contract to represent Alpha's export coal. Somewhat lower mining costs could be achieved, as the merged company expects $40 million to $50 million in savings on synergies. In 2017, the combined entity produced 12.6 million mt of metallurgical coal. Mozambique Production Wobbles After Bad Weather Vale cut annual production guidance this month — from 16 million mt to 15 million mt — due to bad weather. Access to some pit areas has been compromised, which is lim- iting their ability to blend ROM coal, and ul- timately affecting their washplant feed. The problems underline that higher production rates targeted at the mine are not yet stabi- lized, and the export view has been margin- ally reduced for 2018 to 9 million mt. Russian Exports Following Path of Least Resistance Russian metallurgical coal exports have re- mained flat during early 2018. PCI exports have increased, although data is hard to assess, but this has been offset by a slight decline in coking coal sales. Exports to Asia have been affected by limits at Far East ports, which are working at full capacity. Railway maintenance is also likely to fur- ther hamper eastern sales. In 2016-2017, the maintenance peak occurred toward the end of summer, beginning of autumn, so it has yet to see the full impact. The result has been a shift in exports to European ports. Attempts to increase production in Rus- sia have been mixed. EVRAZ increased their sales to external customers by 700,000 mt in Q1 2018. Their subsidiary Raspadskaya plans to increase production at its flagship underground mine by 300,000 mt to 500,000 mt this year. Things have not gone as well for Mechel, who reported a 20% decline in cok- ing coal sales year over year in Q1. Kolmar's raw coal output declined by 20% in Q1 2018. Mechel's travails were largely due to issues with the Neryungrinskaya wash plant, which now washes some Elga coal. As a result of plant stoppages, raw mined coal had to be stockpiled at Elga, and Mechel expects only to start washing and shipping this stockpiled coal in Q3. Mean- while, production from Yakutugol is now permanently lower — about 500,000 mtpy — than previous years due to moving to a different mining area. Since commencing operations in 1983, the Dalrymple Bay Coal Terminal (above) has established itself as Queensland's premier coal export facility.